We drove down a long dirt road. Rainy season had just ended, so the road was flanked by tall grass, papyrus and lush eucalyptus trees. The roads of Uganda are something to behold – almost always made of dirt, with some parts washed away or marked by deep streams from the last rain. The ride is relentlessly bumpy, with lots of stops and starts. One of the drivers called it an African massage. And it takes a long time, getting to where you’re going. Women, men and children on their way to the markets to sell their crops – or maybe walking back from market – fill the roads alongside a steady stream of cows, cars, buses, land cruisers and motorcycles (called boda bodas). We finally pulled up to a church, positioned beside another long, low building we were told was the school, empty because the kids were on holiday. The church looked modest; it was made of brick with a corrugated steel roof and a simple white cross above the front door. Outside, a tree bloomed with the most beautifully scented flowers, but no one around us knew what they were. Tall, bright red amaryllis grew in a line near the entrance. Across the field, my companion and I, both American women, could see women and children from the village, Abole, getting water. We were waiting for some of CVT’s former torture survivor clients, all women, to meet us. They had agreed to visit with us and tell us about their experiences at CVT. At first it didn’t seem like anyone would come. We knew it was a lot to ask. While we waited, we decided to walk down the road to see a dilapidated church. 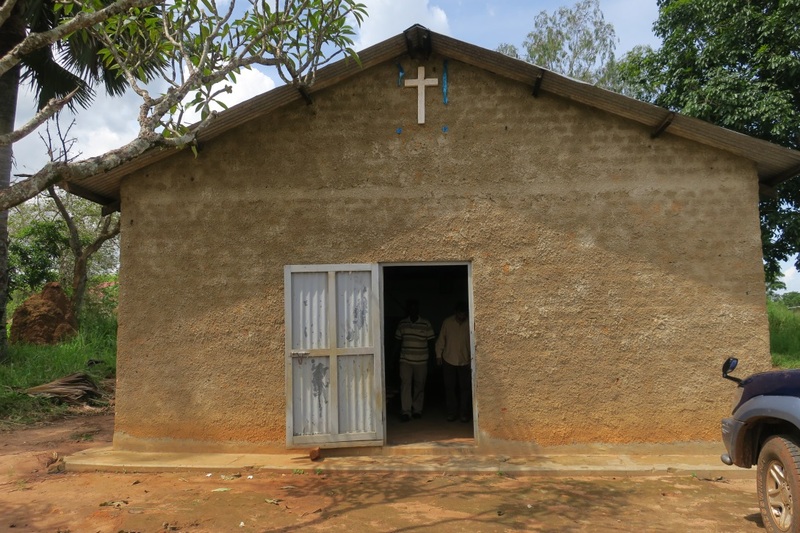 CVT Uganda used to hold its 10-week group counseling sessions there. Earlier, we had learned that structures with thatched roofs like this one stay much cooler than those with steel roofing, but are more susceptible to the heavy rains. We took a few minutes to look around, appreciate the former building’s history of healing, and then headed back to original meeting spot. Benches lined the meeting room. In the front corner were musical instruments, including a local harp, which Gabriele Marini, MA, CVT Uganda’s psychotherapist/field representative, picked up and played while we waited. Moments later, a shadow appeared on the front door. Then a small, slender woman walked in with a baby tied to her back. Gabriele jumped up to greet her. She was shy and so was her baby, who we later learned was a year old. She sat down, and as the others watched the door for more women to arrive, I turned back to look at this young mother. She looked straight ahead into the distance with a pensive look on her face; her baby peered at me cautiously. The other two women arrived in a flurry of activity. One wore a blue shirt and the other a peach shirt. They both wore vibrant head scarves with floral patterns, bright beaded necklaces and big smiles, intended for us. We greeted each other shyly, but soon settled out of our nervousness and even began to laugh. Gabriele joined the conversation, as well as Lakony Ben, who had served as psychosocial counselor (PSC) for the group’s therapy sessions at CVT. Gabriele explained to us that in the women’s culture, Acholi, it is uncommon for a person to talk about himself or herself. You don’t say “I;” you say “we,” and your family and your community comes before yourself. Naturally, then, it takes some time for clients to adjust to the individual-focused CVT therapy model! CVT clients often mention that as they advance through the group therapy sessions, they begin referring to themselves as an individual. When asked about her experience at CVT, one of the women - I’ll call her Rachel - said, “I learned that I could think about myself, that it was important that I think about what I need and not worry about my husband so much. Before CVT, I would think about what my husband does. Now I think about me. My life is a river and it needs to flow, flow, flow,” she said, lifting her hands up while laughing. Another client said, “From birth to very recently, I’ve never talked about myself. I’m very surprised about this!” This instantly energized our conversation; now everybody was talking. Another woman – I’ll call her Mary – said, “Now when my husband is mad, I look at him. Then I ignore him and think about my counseling!” I nodded so vigorously that she pointed at me and said, “Your husband too?” Then we were all laughing. As the conversation grew more serious, one of the women told us that because of her therapy sessions at CVT, she had “stopped thinking the worst.” The others paused and gave her reassuring looks. Later Ben, who had been interpreting the conversation, told us that “thinking the worst” is a common euphemism for suicide. As we continued to talk, the baby – whose name means “God will help him” –jumped down from his mother’s lap and walked a few steps toward me. My delighted response scared him back into his mother’s arms and we all shared another good laugh. When we said our goodbyes, gave hugs and shook hands, even more laughter ensued. Our time together was brief, so we lingered together, not really wanting to part. After we did, I watched as the women walked across the field back to their homes to get ready for another day with their crops. Then I turned back to the road to contemplate the gift of meeting such resilient women – women who endured so much and remain so strong. To see more photos from Fawn's visit to Abole Village, visit CVT's Instagram! CVT Uganda is supported by the Trust Fund for Victims and Fondation d’Harcourt.